Looking for private in-home or in-studio Trumpet lessons? Our Campbell teachers are ready to get you started. Find your teacher today! Check out some of our most popular teachers near Campbell, CA including San Jose, Sunnyvale, Palo Alto, Mountain View and Santa Clara. I have started hundreds of beginner students on trumpet who have advanced to a high level of performance ability. I teach basic musicianship as well as trumpet and cover classical and jazz styles. My students expand their ranges and take on higher difficulty as their lessons progress. I have taught music (K-8) in a private school in Palo Alto for 13 years and have created a very successful program. I conduct 5 bands, an orchestra and a beginner string ensemble. I have started hundreds of children on instruments and have taught dozens of children privately with great results. I have a BA degree from Luther College and did post-graduate work in music at the University of Iowa. Stephen has lots of experience teaching kids and was great with my daughter. He adapted to her level of experience and gave her goals to strive for next time. Very pleased with the whole experience. My 10 years old son loves the way Steve teaches. My son is a beginner on trumpet, but Steve stays calm and make his lesson fun for my son. Not too much pressure, just a daily practice of 10 mins or so. My son is looking forward to his lesson! From playing your first note to playing your first song, you will learn the basics and fundamentals of the trumpet. 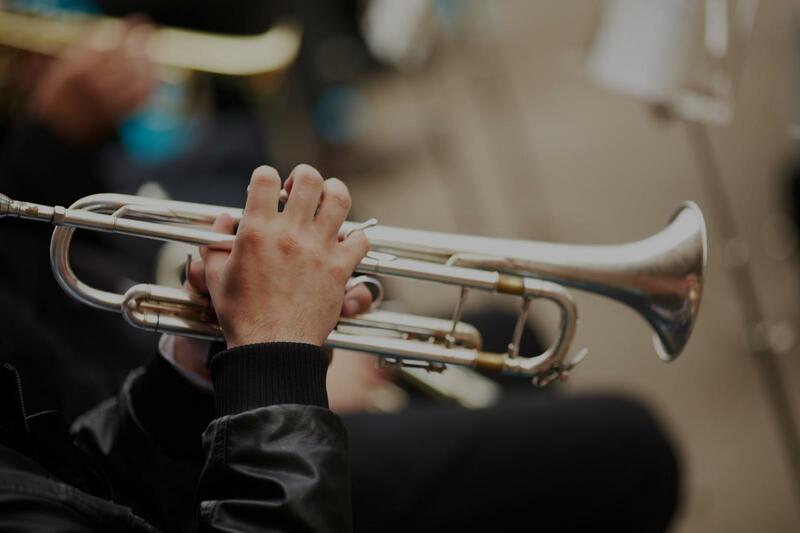 During these lessons, students will learn theory, scales, songs, and much more on mastering the trumpet. I am an 17 year old pianist and trumpet player with over 15 years of experience. I love to teach others the art of playing piano and trumpet and would love to be able to have a full time online job of teaching students how to play, compose, arrange, and perform their pieces. I have over 50 awards from piano competitions to festivals, and over 25 awards for the trumpet. I also strongly believe that every student learns differently and at their own pace, and excel at communicating with people and students. If you take lessons from me, I assure you will go on from beginner to mastering your instrument! Dominic is an overall amazing person, not to mention a wonderful pianist. I highly recommend him to you! Dominic is a wonderful person and is very enthusiastic about teaching others how to play the piano! I teach students of all ages on all the brass instruments. With more than 30 years of teaching experience, I tailor my teaching to the individual needs of both students and parents, and I like to make our lessons fun and productive. I cover all the basics of playing, from correct breathing to correct style, and I impart a deep knowledge and appreciation of music to my students as well. I offer flexible scheduling, with sessions varying in length from 30 to 90 minutes, to help fit all budgets. I am a San Francisco native and a graduate of Lowell High School and San Francisco State University, where I earned degrees in music performance and education. I teach all the brass instruments at my studio in Belmont, at Skyline College in San Bruno, and at Manor Music in Pacifica. I have also taught on the faculties of San Francisco Community Music Center and Walnut Creek Civic Arts. As Trumpeter, Arranger & Bandleader, I lead three of the Bay Area's finest musical groups: The Brassworks, Gabriel's Trumpets, and The Memorial Brass. I perform with Symphony Parnassus, Golden Gate Park Band, Golden Gate Symphony, The E-Ticket Band, Silicon Gulch Jazz Band and the Kally Price Blues Band. I am also Jazz Cornetist and Musical Arranger for San Francisco’s long-running immersive theatrical show The Speakeasy. aying and teaching the brass instruments, I know how to make our lessons educational, productive and fun. In our lessons, I cover all the basics of playing: breathing, technique, rhythm, style, improvisation, etc. You’ll learn the language of music, some music history and theory, and we’ll play duets. As you apply yourself to your musical studies, you will experience improvement and be able to attain your musical goals. Franklin was so patient with my 14-year-old son. We look forward to our next lesson. Mr Davis has been great! He’s very patient, encouraging and helpful! The concept is simple: empowerment to generate mastery on your instrument. I like to work with you at your level, from beginner and up. My goal is to not only help you understand the mechanics of the instrument, but to empower you to create as limitlessly as possible on it. I will be working with you on things such as rhythm, ear training (hearing melodies and recreating them, understanding major and minor scales and how to "hear" music), embouchre (lips) development, breath control, musical sight reading, and understanding musical notation and terminology and beyond through a few of my own and others' techniques. 16 years of teaching at every level from beginner to come-back player to graduate student have prepared me to help every student with the many challenges posed by the trumpet, and to make trumpet playing more fun for every student. I have degrees in both classical and jazz trumpet, and perform in a variety of styles and settings. Whatever your interests, I can help you learn about them. Combining equal parts lyricism and devotion to rhythm, Nikola Tomić is an engaging and dynamic New York City-based trumpet performer whose versatility and enjoyment of soloist and background roles alike have taken him to stages in more than thirty states, as well as to Italy, Mexico, Ireland, and Costa Rica. In New York, he has performed at venues including The Jazz Gallery, Swing 46, the Drawing Room, the Cutting Room, Silvana, St. Peter's Church, Sir D's Lounge, Williamsburg Music Center, the Brooklyn Botanic Garden, and the Miller Theatre at Columbia University. ained a private teaching studio since 2003. He taught from 2010 to 2013 for the Eastman Community Music School, providing instruction in trumpet and music theory, and working with the New Horizons Band Program, and has been on faculty at the Ithaca College Summer Music Academy since 2013. Nikola holds doctoral and master’s degrees in Jazz Studies & Contemporary Media from the Eastman School of Music and a bachelor’s degree in Trumpet Performance from Ithaca College. His teachers have included Clay Jenkins, Bill Dobbins, Harold Danko, Frank Gabriel Campos, and Steve Brown. Can't find a teacher in Campbell, CA? r level and encouraged her." ing. We started at beginner trumpet, then added voice lessons and will soon start the family guitar lessons. Jesse's lessons are never boring. He always does something new and always asks what the student wants to play. Jesse is more than an instructor because he has taught my son to love music. He has exceeded my expectations." atches what the student is doing wrong and helps to correct it on the spot. Highly recommended." San Jose, CA teacher: Stephen E.
ent and focused teacher. I liked his structured method and tools he uses. I was able to get back in groove in no time. person. He cares about his students and motivates them in a positive way! Our son comes home telling us how nice and talented Jesse is. We are very happy to be working with him and Jesse is a great teacher!" en's lessons are fun and low pressure. He is remarkably calm and professional, and he doesn't waste any lesson time. My son looks forward to his lessons with Stephen." usic and so far so good."